Find quality, convenience and space on a home that looks at design from an exciting new angle. Find real style, combined with comfort, convenience and new answers to your needs. 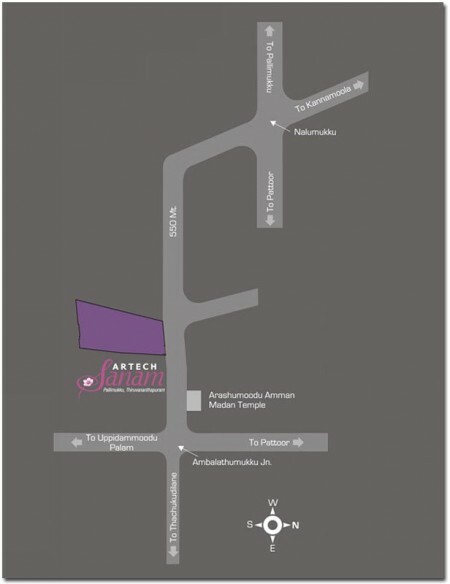 Find it all in Artech Sanam – Apartments which are more than living spaces, much more. Sanitary fittings: EWC wall-hung, concealed cisterns, counter washbasin. All sanitary fittings shall be of ROCA / Kohler / Duravit or equivalent. Faucets: All Faucets shall be single lever concealed diverters CP finish, heavy body metal fittings of Grohe / Roca/ Kohler or equivalent make. Hot water connection shall be provided for overhead shower in each bathroom. Plumbing: All water supply lines shall be in ISI marked CPVC pipes. Drainage lines and storm water drain pipes shall be in PVC. Stainless Steel Sink multi bowl with drain board in kitchen. Towel rods, soap dish and health faucets shall be provided inside the toilets. Window shutters: Prefabricated colour anodised aluminum sliding windows. Door Frames: Main door frame and shutter shall be of seasoned teak wood. Outer face to be PU coated and Inner face melamine finished. Door Shutters: All internal door frames shall be of seasoned teak wood / hard wood with flush door shutter. All internal and external faces shall be melamine finish. Hardware: All hardware shall be in C.P Brass, tower bolts, door stoppers, ball bearing hinges. Locks shall be mortise of Dorset /Yale make or equivalent. Lift lobby and fascia wall & floor using composite marble / granite / vitrified Tiles, as per the architect’s design. Staircases using granite / vitrified flooring with hand railing as per architect’s design. Car park Area : Grano flooring with grooves or exterior grade paving tiles. Foyer / Living / Dining / Kitchen / Bed Rooms : 60cm X 60cm vitrified tiles. Master Bed Room : Laminated wooden flooring / 60cm X 60cm vitrified tile flooring. Master Toilet & Dressing area: Designer ceramic tile concepts 30cm X 30cm for floor and 45cm X 30cm for walls up to height of 8’ 0”(master toilet). Servants Room / Toilet: Ceramic tiles. Balconies / Open Terraces / Decks: Rustic / antiskid / ceramic tiles. Pooja: Coloured granite flooring. Internal Walls: Acrylic / cement based Putty with emulsion paint. Service area – Oil bound / acrylic distemper. Service area – Oil bound / acrylic distemper. External Walls: Whether shield exterior grade emulsion / texture paint. Concealed copper wiring with modular plate switches, centralized cabling system. Switches: All switches shall be Legrand / Schneider / Crabtree or equivalent. Generator: Power backup will be provided for all common services and selected light and fan point in each living, bedrooms inside apartment and a refrigerator point. Adequate ELCB and MCB shall be provided in each apartments. Provision for telephone and Internet shall be provided in the living room and master bed room. GEYSER points in each toilets attached to bedroom. Elevators: High Speed lift shall be provided as per the Govt.norms in each core with automatic doors & SS brush finish of KONE or reputed make. Provisions for Split AC shall be given in all bed rooms. All Bedrooms, living room & family space shall be centrally air-conditioned. Access control entry to the common entrance / foyers and gymnasium. Light sensors for common areas. Mood – lighting in Living and Master bed room. Home security monitoring, gas leakage detectors, emergency panic intrusion alarm, visitor tracking, emergency in any individual apartment. Terrace gardens with sunken slab and waterproofing and drainage facility. Provision for sprinklers and a drip system shall be provided. Interlock Pavers to be laid in driveways. Water bodies and fountains as per the architect’s design. Though Trivandrum is the capital city of Kerala state, it doesn’t go with the traffic jams, over-crowding and hustle-bustle normally associated with such cities. Instead, Trivandrum is a peaceful coastal city that is home to an increasing population of people who value its cultural depths that have so much to offer its inhabitants. Along with the rapidly-expanding IT industry, Trivandrum is also home to some of the best educational institutions and multi-specialty hospitals in Kerala. It offers a great place to settle down and bring up the family, aside from also harboring numerous job opportunities. It offers up-to-date infrastructure and has been proclaimed as the best city to live in, three years in a row. Aside from this, Trivandrum offers great locales to set up home. Pallimukku is one such locality that offers easy availability of all conveniences aside from being a peaceful residential locale. This is also why apartments in Pallimukku always generate great interest as everyone wants to settle down here. Located between Patoor and Pettah regions, Pallimukku is well connected to other parts of the city too. While the nearest railway station is in Pettah, hardly 1km away, the Trivandrum International Airport is just around 5km away too. With a flat in Pallimukku, you can easily access the Medical College area along with the numerous specialist hospitals in the area as well as the central East Fort business area which is less than 5km away. Buying an apartment in Pallimukku makes a great investment.